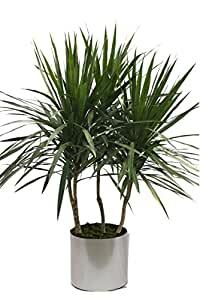 The Tarzan Staggered package includes a 4 foot Dracaena Tarzan grown with 3 main branches and a bushy top making a great tree looking option. The Tarzan is similar to a Marginata with thin spikey leaves and a woody trunk. They do great with low water and like a medium lit area. They are easy to maintain and care for and extremely tolerant to a non plant person. The package includes our commercial grade planter in a color of your choice, deep dish saucer, and moss covering. The Tarzan lends a nice addition to a modern or southwest interior design style and is also at home with a variety of looks. The bushy top gives it more volume than the Standard variety fills a space similar to a medium sized bush. The live tropical plant will arrive cleaned and ready for display in its’ new home.